n Canada, it is sometimes taken for granted that Canadians can always find someone to grab a stick, find some ice and play a game. 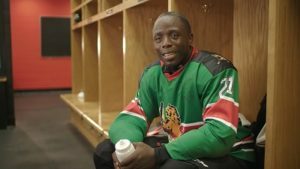 Tim Hortons heard the story about the Kenya Ice Lions and decided to share our love of the game by bringing them to the birthplace of hockey. 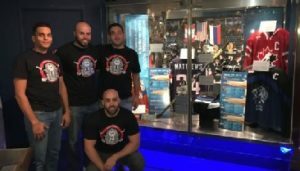 Moved by their love for Canada’s favorite sport, Tim Hortons flew 12 members of the senior Ice Lions team to Canada to have the opportunity to finally play their first game ever against another team. 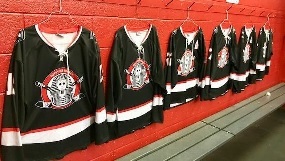 After dressing in brand new CCM hockey equipment and personalized jerseys, they discovered they were in for an even bigger surprise: Sidney Crosby and Nathan MacKinnon were joining them on the ice as teammates. The 35-year-old, who is head of Hockey Algeria and led the country’s first-ever representative team to a creditable third-place finish in the inaugural African Club Cup in 2016, is looking to keep progressing the nation in his beloved sport. Kerbouche will be taking his Algerian team (Algiers Corsaires) to compete in the Arab Club Cup which also features Morocco, Tunisia, Egypt, Lebanon and the UAE, and is due to be televised on Abu Dhabi sports channel early next month. “It’s a nice place to go, I lived there for a little while, and I’m excited to be going back there,” Kerbouche said. “This will be the first time I’m taking my club out there and it should be fun, there is a good amount of teams and the competition should be good, I’m expecting some decent players to be at the tournament. Kerbouche, who attended Central Foundation School in Bow, managed to obtain funding for his team to represent Algeria and scored their first-ever goal, against Morocco in 2008. Morocco beat Ireland 11-4 in the final to win the inaugural Development Cup. It was the first time Morocco won an international tournament in the event that also included Portugal, which finished third, and host Andorra. The four-team tournament is an initiative from some of the smaller IIHF member countries not part of the IIHF Ice Hockey World Championship program to give them an opportunity to play amongst each other similar like the IIHF Ice Hockey Challenge Cup of Asia for the Asian members. Morocco was the strongest team both in the preliminary round and in the final. The team that mostly consists of Moroccans who learned and played their hockey in Europe and the Canadian province of Quebec finished the event with a 4-0 record. Ireland has been the toughest opponent in the preliminary round – even though scores may tell otherwise – and it was similar in the final between the two most skilled and physically strongest teams. During Morocco’s first power play Thomas Carpenter gave Ireland the lead on a breakaway but a few moments later Mehdi Ghazi converted the man advantage to tie the game. The Moroccans continued to be strong and were ice-cold with their chances. Hakim Bouchaoui gained Morocco its first lead and a natural hat trick from Damien Bourguignon made it 5-1 for Morocco after one period. “Of course it was great to have such a good start but even if I scored three goals it was not just me, it was great work from the whole team. We had a good team here. Everybody contributed to winning the tournament,” said Bourguignon. The son of a French father and a Moroccan mother was one of the most skilled player from the European-based contingent. Last season he played in the French second tier for the Clermont Sangliers and this season one league below for the Dijon Ducs. France, which held Morocco as a protectorate until 1956, has a big diaspora of people from Morocco and other North African countries. “I played first time last summer in the Africa Cup. I really appreciated playing in that tournament and that’s why I came again for this event without hesitating a second,” the 25-year-old forward said. The second period against Ireland continued in the same direction the first frame had ended. Youssef Chadli, Charles-Hichem Balha and Yassin Ahrazem scored for Morocco, Ian Courtney had a marker for Ireland before a few players unloaded their emotions in a hard-contested game with their fists, just to later mix together for a more peaceful team photo after the game. The end of the second period continued with four-on-four and one goal each for a 9-3 score after the second period. After exchanging three more goals in the third period Morocco won the game 11-4, got the trophy and celebrated with it and hearing their national anthem, the Cherifian Anthem, in the background. Another player with high-level experience is captain Youssef Kabbaj from Westmound, Quebec, who played three years at the highest level of junior hockey in Canada’s QMJHL, four years of CIS college hockey and since 2016 minor league hockey in Quebec, this season for St-Cyrille Condors (LHSAAAQ). Hakim Bouchaoui, who was born in the Swedish hockey town of Karlstad, is another player who plays amateur hockey in a top hockey country, currently for Swedish fourth-tier team Kils AIK. 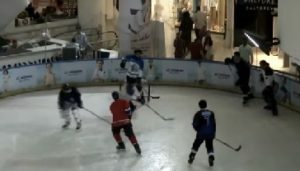 Ice hockey in Morocco is a rather young sport and the first generation of players who started as kids in Morocco is slowly moving into senior hockey. The roster included two young players developed in Morocco. One of them is Mohamed El Idrissi from Rabat. “I started in 2005. They invited me to play for the Rabat Capitals when they started the team and I have liked playing hockey ever since then. I’m very proud to be a member of the national team and represent Morocco,” said El Idrissi, who usually plays one game a week plus practice in the Moroccan capital. The Royal Moroccan Ice Hockey Federation is a life-long dream of Khalid Mrini, who grew up in Morocco before moving to the Canadian province of Quebec. Behind the bench he had his fellow Morocco-Quebecer, Development Director Adil El Farj, and his brother Mimoun Mrini, who lives in Morocco and served as head coach of the team. “We work a lot. Now we have more than 400 players in Morocco. We started last year our first national championship. It’s growing. It’s a lot of work but the future is bright,” said Khalid Mrini. 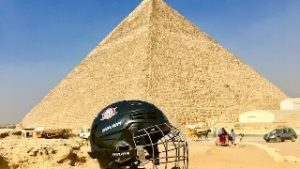 His dream of ice hockey in the North African country started a long time ago. He moved to Quebec as a 17-year-old to study in Canada and immediately fell in love with ice hockey when he saw a Montreal Canadiens vs. Detroit Red Wings game on TV. “In Morocco sometimes you see in the sport news the Stanley Cup or the World Championship but just a 30-second highlight. When I first time saw a full game I started following the Montreal Canadiens and travelled to games a lot in the ‘80s and ‘90s. I love this game because it’s so exciting,” he said. In 1983 he was at the International Pee-Wee Hockey Tournament in Quebec. “I saw all these flags, Canada, United States, Switzerland and so on. I told my girlfriend that one day I’d put my flag there. She started laughing. She said “it’s only I dream”. I knew it was a dream but you can’t live without dreams. 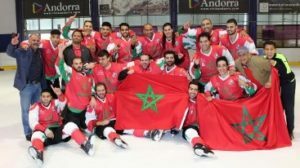 After starting ice hockey at the small rink in Rabat – in the meantime a second small-size rink is used for hockey in Casablanca – Morocco started to look out for international contacts. First Moroccan kids played against kids from hockey countries who were kids of diplomats in Morocco. Later they hosted a Canadian team, French teams, Spanish teams, went to Switzerland for a ten-day camp. In 2008 they participated in the first and only Arab Cup in Abu Dhabi. “In 2010 we became IIHF member, something I’m proud of because that’s where all the big and smaller hockey countries are members. I started to speak with many presidents from other countries and look for help,” Mrini said. Now he has his Moroccan flag in other tournaments too including the 2017 Development Cup where Morocco for the first time played national teams from Europe. “I’m living my dream and being here today is still a dream because you have the Moroccan flag here, you hear the national anthem with the other countries. But it’s only the beginning. I want to show the hockey world that we’re serious. Hockey in Morocco is not exotic. We’re not just for the photo gallery,” Mrini said. “Hockey is not just the big countries like Canada, USA or Russia. We have here the coverage on the IIHF website. And last year Luc Tardif came to Morocco. When I told the government that he is the IIHF Treasurer and President of the French Ice Hockey Federation, they realized that the IIHF is really supporting us. It was like a wake-up call and they started helping us more and more,” he added. While Morocco has passionate diaspora players who represent the country of their roots, hockey has also grown in the country itself since its start. What once began with six players when the ice rink in the Mega Mall in Rabat opened is now a sport with eight club teams. When the national championship begins later this month, they will be joined by a ninth team. Mrini’s dream is not over yet. He knows that to develop hockey within the country and be able to play internationally with homegrown players it needs more rinks. While the federation is working on having a third small rink in Agadir, the challenge is to get the first full-size one to be able to play five-on-five and join more established ice hockey countries in the IIHF Ice Hockey World Championship program. “Now I’m looking to build an official ice rink in Morocco. In Rabat, or Casablanca. It’s not so important where it is but to have a big ice arena. I want to start in the IIHF Ice Hockey World Championship Division III,” Mrini said.